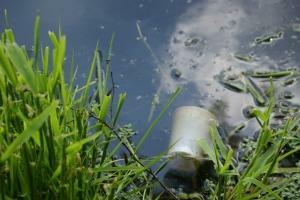 Water pollution is when waste, chemicals, or other particles cause a body of water (i.e. rivers, oceans, lakes) to become harmful to the fish and animals that need the water to survive. Water pollution can disrupt and negatively impact nature's water cycle as well. Sometimes water pollution can occur through natural causes like volcanoes, algae blooms, animal waste, and silt from storms and floods. A lot of water pollution comes from human activity. Some human causes include sewage, pesticides and fertilizers from farms, waste water and chemicals from factories, silt from construction sites, and trash from people littering. Some of the most famous incidents of water pollution have been oil spills. One was the Exxon Valdez oil spill which occurred when an oil tanker hit a reef off the coast of Alaska and over 11 million gallons of oil spilled into the ocean. Another bad oil spill was the Deepwater Horizon oil spill when an explosion at an oil well caused over 200 million gallons to spill into the Gulf of Mexico. Air pollution can also have a direct effect on water pollution. When particles like sulfur dioxide get high into the air they can combine with rain to produce acid rain. Acid rain can turn lakes acidic, killing fishes and other animals. Water pollution can have disastrous effects on the environment. Pollution in the water can reach a point where there isn't enough oxygen in the water for the fish to breathe. The fish can actually suffocate! Sometimes pollution affects the entire food chain. Small fishes absorb pollutants, such as chemicals, into their bodies. Then bigger fishes eat the smaller fishes and get the pollutants too. Birds or other animals may eat the bigger fishes and be harmed by the pollutants. One example of this was the use of the insecticide (bug killer) DDT. When birds of prey ate fishes that were infected with it, they would lay eggs with thin shells. The population of birds of prey began to drop until DDT was banished. Sewage can also cause major problems in rivers. Bacteria in the water will use oxygen to break down the sewage. If there is too much sewage, the bacteria could use up so much oxygen that there won't be enough left for the fish. 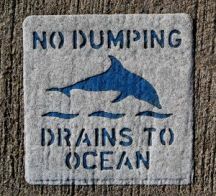 Water pollution from major events like acid rain or oil spills can completely destroy marine habitats. One of the most precious and important commodities for life on planet Earth is clean water. For over 1 billion people on the planet, clean water is nearly impossible to get. Dirty, polluted water can make them sick and is especially tough on young children. Some bacteria and pathogens in water can make people so sick they can die. Sewage - Even today sewage is flushed directly into streams and rivers in many areas around the world. Sewage can introduce harmful bacteria that can make people and animals very sick. Farm animal waste - Waste from large herds of farm animals such as pigs and cows can get into the water supply from the runoff of rain and large storms. Pesticides and herbicides - Pesticides are often sprayed on crops to kill bugs and herbicides are sprayed to kill weeds. These strong chemicals can get into the water through runoff of rain storms. They can also contaminate rivers and lakes through accidental spills. Construction, floods, and storms - Silt from construction, earthquakes, floods, and storms can lower the oxygen content in the water and suffocate fish. Factories - Factories often use a lot of water to process chemicals, keep engines cool, and for washing things away. The used waste water is sometimes dumped into rivers or the ocean. It can be full of pollutants. Save water - Fresh and clean water is a precious resource. Don't waste it! Take shorter showers, ask your parents not to water the lawn, make sure the toilet isn't running, and don't leave the faucet running. Don't use weed killer - Ask your parents if you can pull the weeds in the yard so they don't need to use weed killer (an herbicide). Scrape your plates clean into the trash and don't put grease into the kitchen drain. Trash - Always pick up your trash, especially when at the beach, lake, or river. Soap from washing your car can run down the street drain and cause water pollution. Only around 1% of the Earth's water is fresh water. The rest is salty and we can't drink it. Around 40% of the rivers and lakes in the United States are too polluted for fishing or swimming. The Mississippi River carries around 1.5 million tons of pollution into the Gulf of Mexico each year. Between 5 and 10 million people die each year from water pollution related illnesses.